Saxophone: Teklit Aron. Kirar (Eritrean wind instrument): Andom G/Slassie Wedikeshi. Recorded & Mixed at Kultur Studios Norway by Opsal Jonathan. Produced by: Andom G/slassie Wedikeshi. Mastered at APR/Multimaster Studios Olso Norway by Arne Peter Rognan & Sampeace Brown © GT World of Beauty Music. Executive Producers: Sam U GeorgE., Omari S. Tabu for AMUN. © & (p) 2007 amun/T-kay/Street Solid records Scandinavia. The Norwegian- Oslo based singer and performer “ANDOM Gebreslassie Wedikeshi “ is originally from Eritrea. 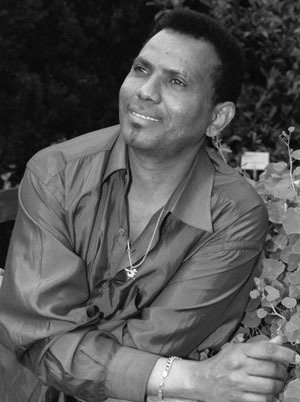 Andom is a well known figure and house hold star in Eritrea where he was born. He grew up in Erirea where most of his artistic works were layed down before his exit to Europe. And now has become a resident of Oslo. He has been able to put together a solid ensemble called “Merhaba Band”. They ‘ve joined other Oslo bands in spicing the norwegian multicultural music scene with their earthy and catchy tunes based on eritrean traditional folklore and world music concept. The song “Stalile” tells about the people, culture , love and call for national cohesion. It’s a tune that sinks into the heart & soul as you keep listening and understanding the music. It doesn’t matter which language you speak, it certainly would captivate your mind same time relate you to Africa’s horn, it’s people, culture, history and horitzon. Andom Gebreslassie Wedikeshi and his band “Merhaba” are prepared to take gigs, concerts, tours, festivals etc at any giving time and any where. For further contacts & bookings: AMUN-African Musicians Union in Norway.